George School’s service trip to Cuba was featured by ahora.cu, a Cuban news website. The trip’s mission of peace and friendship was highlighted by a game of volleyball between the American and Holguin students from the Holguin Quaker Church of Friends. “Beyond competition, the game was more about friendship and sharing, which is one of the most important goals of the mission,” said Reynaldo Cruz Diaz. He reported that the group included eleven students and three teachers, who all have been working to help restore different churches in the area. This summer trip is the twentieth anniversary of George School’s first service trip to Cuba. While there, George School students gained a new respect and understanding of Cuban culture and the Cuban people. “Coming here and finding out how friendly and generous the people are has shattered [the stereotype of Cuba] I had as a child,” said Carol Bernate ’13. “They say that they are not rich in terms of money,” added Dan Simon ’13, “but they are rich in spirit.” Read more. By the time most of you read this we will be winging our way home. We expect to leave the church tomorrow morning at 7:30 to catch the 10:30 flight from Holguin to Miami. You won´t be able to check on the flight because flights to and from Cuba are not regularly scheduled flights. We expect to arrive in Philadelphia a few minutes after 7:00 p.m.
We began Friday morning with a special breakfast which included scrambled eggs, ham and a cheese that our hosts purchased in a stop on our return from Santiago. After breakfast we began packing, which involved deciding which things we are leaving from those we expect to take with us. It appears as if there will be a windfall of clothes and other materials from our students and teachers. After breakfast Tom, Allison, and Fran met with Odalys who was recently elected to the Presidency of the Cuban Yearly Meeting of the Religious Society of Friends. When we arrived we turned over all of our cash to Odalys which amounted to several thousand dollars. Part of the problem in our travel to Cuba is we aren´t permitted to use credit cards or travelers checks because of the US embargo on Cuba. It would be virtually impossible for us to run our program in Cuba without the help of Cubans with the integrity to hold and account for the large amounts of cash we have to carry. In addition to her position as the President of the Yearly Meeting, she is also a prominent banker in Holguin and a respected member of the Communist Party (for the older among us the world is turned upside down). After the meeting with Odalys several students went the few blocks to the center of town to buy some the few things available to tourists. Students have been alerted to bring back only those things which are acceptable under the rules of the embargo. Our lunch today (the last lunch) was the most elaborate meal we have had. In addition to a wide variety of dishes, Carlos, the man who lives in the church, runs the chorus, and helps out in the kitchen prepared an avocado dish with a map of Cuba carved into the guacamole. We traveled to Floro Perez, a tiny village about 25 minutes north of Hoguin on the road to Gibara. In the entire area there are only about 5,000 people. We expected to do service work and have a fairly elaborate good bye party. Unfortunately, there was no work for us and there were no planned activities. We had to wait approximately 7 hours to have our dinner and there were very few Cubans there and even fewer who we knew. Again our students were wonderful. They recognized that there was little that could be done concerning the situation and they made the very best of a difficult experience. They napped, played football, soccer and ping pong amongst themselves and with their Cuban hosts. The eleven students in our group were simply outstanding in almost every regard. When we were involved in heavy and difficult work they all took part willingly and enthusiastically. When it came time to clean up after meals they regularly jumped up to wash and dry the dishes. All the students whether or not they spoke Spanish took advantage of the opportunity to interact with Cuban students and adults. It took a lot of courage but they did an excellent job. It is frightening to be in a strange place away from parents and familiar surroundings; they all handled the situation courageously. When there was an opportunity to dance with Cuban students they immediately joined in and appeared to have a wonderful time. When the opportunity came to play volleyball with the Young Communists, they played enthusiastically and quickly began conversations and handled the opportunity as you might hope young people would do when trying to interact with people from very different backgrounds. There were several of these interactions that brought tears to my eyes. I know we don´t have to tell you this, but your children are treasures. We are incredibly proud of all they have done including their efforts to learn as much as possible about Cuba. It has been a pleasure for Tom, Allison, and me. We want to thank you for your willingness to allow your children to take part in this unusual program. We think it has been an excellent trip, and it is largely because of the character of you children. We started the day with a late breakfast at 8:00 a.m. consisting of the usual fresh fruit and bread. As Fran had requested, we then had the chance to play volleyball with young communists and other students from a polytechnic high school. It was an exciting and incredible experience for all of us. Meanwhile, Fran was whisked away to a secret room so as to discuss the fall of the U.S. blockade of Cuba (or possibly George School´s future relationship with this group of students). Also during the volleyball game, many of us were interviewed by a reporter for a local newspaper in Holguin. He seemed very nice and spoke the most fluent English we have yet encountered. We are all very excited to read the article which will be published in English, French, and Spanish. The plan is to share the link and post it to the George School website as soon as possible. We proceeded to paint the exterior of the church blue until we ran out of paint, at which point we had fresh coconut water and went for a walk. During our walk we visited the house of one of the church members. Tom commented that it was the poorest house he had ever seen. It was little more than a shack with curtains dividing it into three small rooms. However, they were very happy to show it to us and offer fruit from the tree out back. Upon return, we were treated to a vegetable and pork soup cooked for many hours in a cauldron over an open fire. We returned to Holguin with the Calabazas church half painted and had a relaxing evening. To finish the day, we watched a Cuban propaganda movie about US assassination attempts on Fidel, which enlightened us to the perspectives of many Cubans. We continue to pack in many life changing experiences into these last few days in Cuba. We are excited for tomorrow and even more excited to return on Saturday despite the amazing friendships and sense of belonging we have developed here. It is our eleventh day in Cuba and we have four days left to go. We had an early start this morning as we woke up at 5:30 a.m., had breakfast at 6:00 a.m., and changed a small amount of money for our upcoming shopping excursions in Bayamo and Santiago. Today we traveled to Bayamo, a beautiful city with museums and many street vendors. But today, because of the rain, the vendors were not out but that did not stop us from visiting the museums and appreciating the beauty of the city. When we first stepped off the bus we were slightly discouraged by the rain, but it was another experience, and I think in the end we all appreciate all the experiences we can have in Cuba. First we went for a walk looking for a store that sold umbrellas, and in the end none of the stores had umbrellas, but we discovered a Hamburguesa, a Super Hamburguesa and a Pizza Tropical, not that we ate at any of them. After that adventure we walked to our first museum, which displayed art of the three revolutions and taught us about Cuban history, and Bayamo´s history in particular. There was a very special exhibit which showed a sculpture representation of the time the people in Bayamo burned down the city to avoid being controlled by the Spanish again. Another defining factor of Bayamo is that the person who wrote the Cuban national anthem wrote it in that museum. The other major reason Bayamo claims itself to be the revolution city is because Fidel Castro came back to Cuba to a place near Bayamo when he returned from Mexico, which is where he went after he was imprisoned. The second museum we went to was a wax museum, which had surprisingly realistic wax figures of famous Cuban people. Some of the figures were so realistic that I felt as if they were watching me and would move at any second. The most impressive thing about them was that the people who made them were not professional artists. The museums were very enjoyable. Our guide Hector wanted to show us one more historical thing before lunch. He took us to go see the window where the first romantic song entitled ¨Bayamo¨ was sung, which was a sweet thing to show us. Then we were hungry, so Hector saved us by allowing us to have lunch earlier than we originally expected. The restaurant was entitled La Bodega. They served us bread and butter, tomatoes and cucumbers as appetizers, and then beef, rice, and mashed potatoes for the main course, and lastly rice pudding with cinnamon for dessert. After we devoured our lunch, we got back on the bus and slept and journaled as well as dropped off our friends from the church. Bayamo was a raining adventure! When we returned to the church, we slept and read until Tom announced the option of a trip into town for the internet cafe and shopping that most of us decided to go on. Following our experiences of checking our emails, facebook pages, and updates on our favorite sports teams and players, we wanted to buy hand-crafted gifts but the stores were closed. Luckily we were able to buy all the wooden trinkets we could want from street vendors, which I think is actually a better experience. When we returned to the church, they served us a delicious dinner, as always. I believe Nena makes better food than any restaurant we have been to. All in all, today was another experience in Cuba that we would never trade. This is Kate Wurz here writing to you all about shenanigans today during our venture in Gibara. We woke up around 7 o´clock and began our day with an outstanding breakfast of scrambled eggs, bread, pineapple, mango juice, and coffee. The staff there is very nice and friendly. The cook always prepares a separate vegetarian meal for Julia whenever the main dish has meat. After breakfast we painted the courtyard in the church. It is amazing how much work you can get done in one morning with fifteen painters. To paint the tricky spots we had to use some creative techniques. Trey and I climbed onto the roof of the second floor and painted the very top of the wall. Heights don´t usually bother me, but this was pretty scary. (Don´t worry Karen, I only got a little scraped up). We had already started on the second coat by lunch. Lunch was another delicious meal, and once we were recharged we finished the second coat and then cleaned up. That afternoon two Cubans offered to take us to a beach. Even though a lot of us were tired and it looked like a storm was on its way, we forged ahead. It started to rain on our way there, but we still continued. By the time we got to the beach, it was a monsoon. The beach was just a little cove with no sand only rock. At first Tom said we weren´t going to swim, but we could go look at the water. Disappointed and drenched to the bone, a few of us ran to find some shelter from the rain. When we (those who sought refuge) returned hoping to go home, we found the rest of the group hanging out in the cove, so we joined them. The water in the cove was warm, so we hung out there for a few minutes. Then we heard some thunder. With that, we quickly got out and grabbed our bags and towels. The streets had already started to flood. We walked (for some, including myself, it was more of a sprint) back to the church. When we got back we headed for the showers. But many decided to just grab their soap and shower in the rain. Once we were clean we packed up our overnight bags and enjoyed one last meal in Gibara. 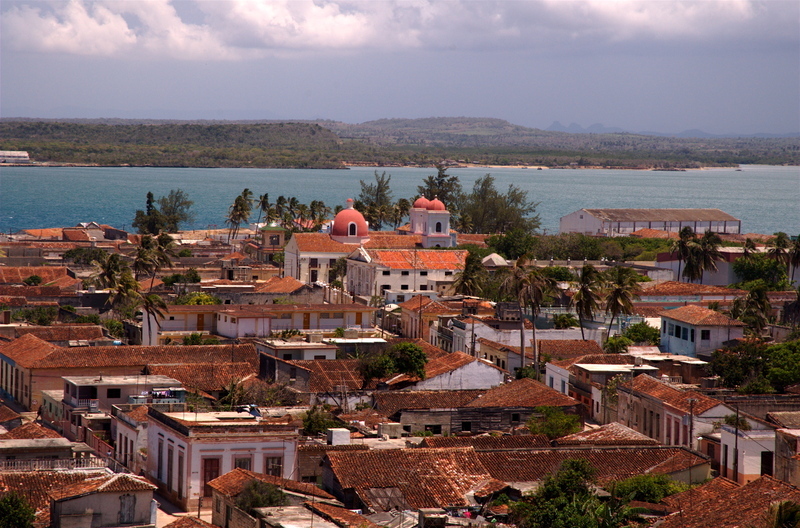 We returned back to Holguin and I started this blog. Everyone is doing great. See you in five days! This is Jonathan writing on behalf of our twisted little group, which has began to feel more and more like a family with each setting of the sun. We are currently stationed on Cuba´s northern coast in the quaint and beautiful seaside village of Gibarra (think Cape May with a dash of mountainous Hawaii, and then mix the whole mess in a blender with 3 solid hours of Shakira´s ¨Hips Don´t Lie¨). How did we get here? The short story is via a ¨Wawa¨ bus. The long story is better written and far less interesting, but if you care for the welfare of your precious child, read on. We awoke at the spritely hour of 7:30 to enjoy a delicious—albeit repetitive—meal of coffee, mangos, and Cubanbreadthing. Without sounding spoiled, we´ve all gotten to the point where, at each meal, we fantasize about eating the foods that we miss so dearly, and how we can´t wait to consume at least 3 Baconators (or veggie burgers in Julia´s case) upon touchdown in PHL. Our breakfast conversation consisted of the typical subjects: Jungian personality types, Cuban anti-imperialist propaganda, bodily functions, etc. etc. After this, we were changed into our Sunday´s best for another extremely ascetic and earth-shaking EvangiQuaker service, which unanimously felt much longer than the one previous. For many of us, these services have been instrumental in understanding the true nature of non-reform religion…and by instrumental, I mean that they have beaten us over the head without mercy. The church we are staying at in Holguin is filled with incredibly kind and selfless people, but on any given Saturday night or Sunday morning, they transform into something far more terrifying than El Chupecabra. I say this in jest, of course, but we have definitely felt some tension between our brand of feel-good, cutesy, light-of-god-in-everyone Quakerism and their if-you-don´t-do-everything-in-your-life-solely-for-JESUS-you-are-going-straight-to-el-inferno Quakerism. After this enlightening service, we boarded the bus for Gibarra with our usual driver, Ronaldo. Hollywood really needs to get a hold of this guy, because in order to successfully drive a tourist bus through the rattlesnake streets of Holguin, you need to have juevos of steel. The trip took roughly 40-minutes (that´s Cuban minutes…time works very differently here, usually dependent on Señor Castro´s mood (Believe it or not, America works more or less the same way, Obama is just far more emotionally stable.).) and most of the group used this down time to take a well-deserved nap. The landscape was dotted with artful billboards memorializing various revolutionary leaders, and eventually a clear view of the indescribable seaside was in view. Upon arrival in Gibarra, we were introduced to the staff of the Quaker church, including Ramòn, who speaks real, fluent English! Ramòn was recently elected president of the board of International Quakers, which, for those in the know, is kind of a big deal. After getting our possessions settled, we all noticed an extremely different vibe coming from this town. It´s less urban, more laid back, and is very pretty to look at. The church actually looks less like a place of worship and more like a 4-star Bahamas hotel. This is a refreshing change of pace for everyone. Lunch was served at around 1, and consisted of plantains, fruits, and swordfish (swords and all!). We also found ketchup. If you do not understand the importance of this, you have never been a teenager in a foreign country. From there, we got into our swim gear and headed off with some of the church´s youth to explore the town and relax on the beach. They took us up an impressively steep hill to get a breathtaking panoramic view of the ocean and the mountains. Tom, of course, used this opportunity to tutor us on our Cuban military history. The beach itself was fantastic. Desi, Dan, and Evan rented a paddle boat and treated our young tour guides to a scenic ride, while the girls, Trey, and I played an intense game of ¨Chicken¨ (O Pollo, si prefieres). Needless to say, a lot of fun was had. We took a different route on the way back to the church which involved passing a beautiful hotel that is nearly finished construction. We´ve noticed many things like this since being here and keeping our eyes open; subtle hints that the ideologies of the Revolution and the Communism that it extols is being replaced by a more free-market mindset. Very interesting. We ate dinner (chicken, fruit, real French fries) in the church´s dining hall, and then piled into the pews of the church for yet another service. Luckily for us, the Quakers at this church have for more in common with us, and thus the service was actually very elegant and enjoyable. It´s easy to understand why Ramòn was chosen for such a prestigious position. The man truly has a way with words, even if I can only understand 75 percent of them. However, the service did lead many of us to feeling homesick. The theme of the night was, appropriately, Father´s Day, and giving thanks to our Fathers, both divine and mortal. We want all of the fathers to know that we miss you a ton, and wish you all a very happy Father´s Day. And yes Mom(s), I/we miss you too. Now we´re playing cards and accusing each other of cheating, the usual before-lights-out ritual. I can honestly say that today has been my favorite day of our journey thus far. I wish that I could more accurately capture the beauty of Gibarra, but I fear that words may not be good enough. It has reminded me once again why Cuba was, and is, a place worth fighting for. Tomorrow we begin work in Gibarra, doing some painting of the more dilapidated sections of the church and possibly constructing some other…constructions. Then it´s back to Holguín. P.S. Dad, I really wish you were here to see this town. They must have some incredible scuba diving. Unnnnbuhhhlievable! Happy Father´s Day…I hope you got my card. Tell Pop-Pop I said Happy Father´s Day as well. This is Julia writing. Today we woke up early (think 5:30..) to take a long bus ride to Salto de Guyabo, a huge waterfall in a jungle. The fourteen of us along with twenty-five Cubans piled onto a gigantic tour bus to travel two hours into the mountains. Picture a huge coach bus trying to navigate one way streets, highways with no visible signage, and dirt inclines that last for miles. Different world. 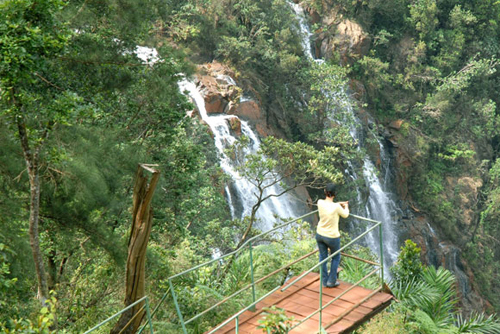 We arrived at Salto de Guyabo before 10 a.m. to breathtaking views of the valley and waterfalls. We got to climb up tree houses and go out on rickety planks overlooking some real cool stuff, and we were told that there would be two different hikes before lunch. Little did we know what lay ahead! The first hike we took was very nice. We walked down a path and saw beautiful views, took lots of pictures, and saw a little manmade pool. We were told that we could swim in the pool, but if we chose to take the second hike, we could swim in a natural pool at the foot of the waterfall. Everyone picked the second option, because it sounded totally awesome. We were told that the second hike would be a physically challenging and that it would take about an hour and a half each way, with some time at the bottom of the waterfall to play. OMG!! Let me describe for you what it actually involved…. We started out down some very misleading steps with a nice railing that made me believe this whole thing was a good idea. After the 15 or so steps, all we saw was a muddy, winding path down a steep mountain covered in slippery rocks. If you´re thinking to yourself right now ‘WOW, my kid must have hated that’ — you may be right. It is very possible that I have never been that scared before in my life (yeah mom, I am serious). Our guide was there to grab onto us every time we needed help. I pulled ahead with Anna, Kate, Carol, and Michelle (with the boys and Martina following close behind) to try and get this endless hike over with sooner. We all gathered for a five minute break about fifteen minutes before the bottom of the 1.5 mile (completely made that number up, but it was long) downward hike, and it was clear that we were all fine. A few of the children that came with us were really young and completed the hike in flip flops and ballet flats. Finally, we got to the waterfall after only a few minor wipeouts along the way. The view was gorgeous! Everybody cooled off by jumping, flopping, or literally sliding into the pool created by the waterfall, and even though I was a little bit too grumpy and scared to go in, it looked like a lot of fun. Happily Dan had brought his waterproof camera, so there were quite a few fun photo-ops underneath the falls. All good things must come to an end, and it was time do the uphill leg of the hike from hell. I was actually surprised how much easier going up was, and it was a really good workout. Regardless, everyone was very happy to finally reach the top, drink water, and eat! We had a fun late lunch with our Cuban pals and then we set off again on our giant bus around four. Most people fell asleep on the bus ride home because we were pretty wiped out. I think we were all very relieved to arrive back at the church and relax, and everyone was happy to hear that we do not have to attend church services tonight. Right now everyone is chilling, and we are hoping to get to bed early! Tomorrow we are going to Gibara, a smaller town on the water. We´re planning to stay overnight there and may not have internet access, so there is a chance a blog will not be sent. Special father´s day shoutout to Paul and also everyone else´s dad. It´s Anna here, writing after another long day in Cuba, which began as usual with our breakfast of mangoes, sweet pastries, rolls, and plantains. After breakfast, we went up onto the roof for work. However, there was once again very little for us to do. Jon, Martina, Carol, Julia, Trey, and I, returned to ground level to work in the church cleaning the benches and fans. While we were cleaning, Jon and I were summoned to create a small mural that would hang as a poster in the church. Jon and I continued to work on the mural until lunch, while the others returned to the roof, where they mixed cement, moved cinder blocks, and swept the work area. Trey impressed all by carrying a very heavy bag of cement by himself, and Evan and Michelle made art forms as they mixed cement. Desi and Dan continued with the work of cement mixing and cinder block construction support. Following work, we had a lunch of rice, boiled plantains, chicken, potatoes, and bean sauce. For dessert, there was a delicious fruit mixture that smelled just like apple pie, since it was coated with cinnamon. There was little time to relax after lunch today because we went to the internet cafe! The little, air conditioned cafe contained only three computers, so we went in shifts to ensure that we all got a fair amount of time. Everyone was anxious to go to the internet cafe, since we all wanted to make sure that we were going to use our precious 20 minutes of internet time efficiently. When we returned to the church we had an hour of free time, then it was off to visit a member of the church, who recently had surgery. We had a lovely time bringing our well wishes for a speedy recovery, as well as several reenactments of last night´s performance. We then moved along to our next destination, which was Ruben´s house (the barber from yesterday, who is also a member of the church) for dinner. As we waited for Ruben´s family to prepare dinner, our group was continuously entertained by the most delightful baby. Ruben´s daughter, Anaabril, ran around while we chatted and sang to a fun playlist of Beyonce and Backstreet Boy songs. Tonight´s supper was split into two courses, the first of which was pretty American. It was composed of spaghetti with a tomato sauce, pizza, fried bananas, fruit cups, and bread. The second course was much more Cuban as it was comprised of pork, beans and rice, shredded cabbage, and fried potato skins. Kate´s birthday celebration continued when our group was treated to a tasty vanilla cake. The night reminded us all how truly giving the Cubans are; the family came home right after work to prepare our dinner and as we left each received a flower and a mango. As we left Ruben´s house, it was agreed upon by many that this was one of the most fun and special nights of all, though we look forward to many more adventures! It´s now past bed time, so I think that will be all for tonight!